PLAINVIEW, N.Y. August 14, 2018 – Vaso Corporation (“Vaso”) (OTCMKTS: VASO) today reported its operating results for the three months ended June 30, 2018. “Therefore, we anticipate revenues to continue to grow as well as significantly improved financial results for fiscal 2018,” concluded Dr. Ma. For the three months ended June 30, 2018, revenue increased 3% to $18.4 million from $17.9 million for the same period of 2017, due to the increase of $0.8 million, or 13%, in commission revenue in our professional sales service segment as a result of higher volume of equipment deliveries by our partner, offset slightly by the lower volume of equipment sales in our equipment segment and a 1% decrease in revenue in our IT segment. Gross profit for the second quarter of 2018 increased 7% to $10.4 million, compared with a gross profit of $9.8 million for the second quarter of 2017. This increase is primarily the result of the 15% increase in gross profit in the professional sales service segment resulting from the increase in revenue, and an increase of 2% in the IT segment as margins improved in this segment, partially offset by lower gross profit in the equipment segment. Selling, general and administrative (SG&A) expenses for the second quarter of 2018 increased 2% to $10.4 million compared to $10.2 million for the second quarter of 2017. The increase is primarily attributable to an increase in personnel costs in the IT segment, partially offset by decreases in the professional sales service and equipment segments. Research and development costs decreased 3% to $252 thousand in the second quarter of 2018 compared to the same quarter of 2017, principally due to lower software development costs in the IT segment. Net loss for the three months ended June 30, 2018 was $446 thousand, an improvement of $541 thousand when compared with a net loss of $987 thousand for the three months ended June 30, 2017. Net cash used in operating activities was $2.2 million for the six months ended June 30, 2018, compared to cash provided from operations of $1.4 million for the same period in 2017. The decrease was principally due to the decrease in deferred revenue in the professional sales service segment. 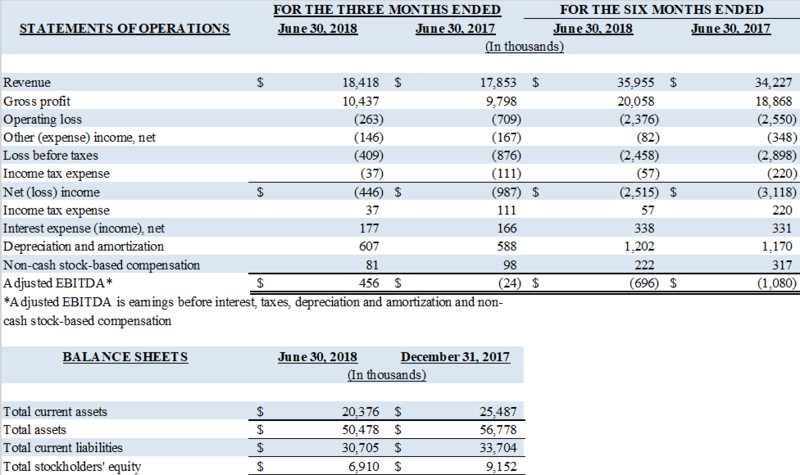 Net cash at June 30, 2018 was $3.2 million, compared to $5.2 million at December 31, 2017. Deferred revenue remains substantial, at approximately $20.2 million as of June 30, 2018, compared to $23.1 million at December 31, 2017, which will be recognized in the future when the underlying equipment or services are delivered and accepted at the customer site. Our shareholders’ equity decreased to $6.9 million as of June 30, 2018 from $9.2 million as of December 31, 2017. Vaso Corporation is a diversified medical technology company with several distinctive but related specialties: managed IT systems and services, including healthcare software solutions and network connectivity services; professional sales services for diagnostic imaging products; and design, manufacture and sale of proprietary medical devices. •	VasoTechnology, Inc. provides network and IT services through two business units: VasoHealthcare IT Corp., a national value added reseller of Radiology Information System (“RIS”), Picture Archiving and Communication System (“PACS”), and other software solutions from GEHC Digital and other vendors as well as related services, including implementation, management and support; and NetWolves Network Services LLC, a managed network services provider with an extensive, proprietary service platform to a broad base of customers. •	Vaso Diagnostics, Inc. d.b.a. VasoHealthcare, provides professional sales services and is the operating subsidiary for the exclusive sales representation of GE Healthcare diagnostic imaging products in certain market segments in the USA. •	VasoMedical, Inc. manages and coordinates the design, manufacture and sales of EECP® Therapy Systems and other medical equipment operations, as well as operates the Company’s overseas assets including China-based subsidiaries Biox Instruments Co. Ltd. and Life Enhancement Technology Limited. Additional information is available on the Company’s website at www.vasocorporation.com. Except for historical information contained in this release, the matters discussed are forward-looking statements that involve risks and uncertainties. When used in this report, words such as “anticipates”, “believes”, “could”, “estimates”, “expects”, “may”, “optimistic”, “plans”, “potential” and “intends” and similar expressions, as they relate to the Company or its management, identify forward-looking statements. Such forward-looking statements are based on the beliefs of the Company’s management, as well as assumptions made by and information currently available to the Company’s management. Among the factors that could cause actual results to differ materially are the following: the effect of business and economic conditions; the effect of the dramatic changes taking place in IT and healthcare; continuation of the GEHC agreements; the impact of competitive technology and products and their pricing; medical insurance reimbursement policies; unexpected manufacturing or supplier problems; unforeseen difficulties and delays in the conduct of clinical trials and other product development programs; the actions of regulatory authorities and third-party payers in the United States and overseas; and the risk factors reported from time to time in the Company’s SEC reports. The Company undertakes no obligation to update forward-looking statements as a result of future events or developments.